The "Chain of Survival" is made up of "Early Access to the emergency response system, early CPR to support circulation to the heart and brain until normal heart activity is restored, early Defibrillation to treat cardiac arrest caused by Ventricular Fibrillation and early Advanced Care by EMS and hospital personnel". "Early Defibrillation to treat cardiac arrest caused by Ventricular Fibrillation" means getting and using the AED as fast as possible. Most patients (≧8 years old) whose heart stops beating suddenly, first experience ventricular fibrillation and the heart quivers, causing inability of the heart to contract efficiently to eject adequate volumes of blood. The only way to be decided is to use the AED to reestablish the normal heartbeart. Survival rate can be increased substantially if the defibrillation is done as soon as possible within 5 minutes. 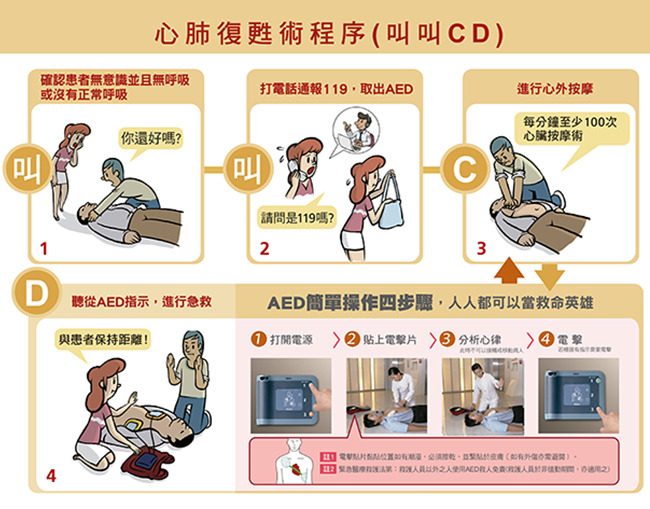 AED is designed specially for non-medical staff, used in first aid for sudden cardiac arrest. People who have not been trained in AED can also save sufferers by AED following the instrustions. 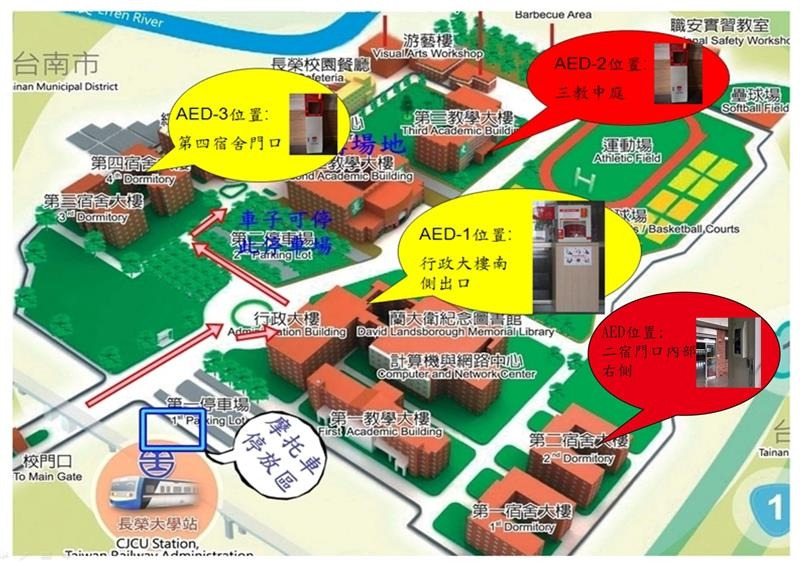 How many AEDs in CJCU Campus? At where? Currently 3 AEDs in CJCU campus. What's Inside the AED Cabinet? Plug in the connector, if necessary. Make sure no one, including you, is touching the person. Push the analyze button if necessary, let the AED analyze heart rhythm. Push the "shock" button, if necessary. Continue cardiac compression until the AED pads are attached well. If the patient is lying on a pool of water, move him to a dry place and wipe the chest dry before operating. When requesting for help or taking the AED, on-site telephone can be used to contact the security offce (ext. 1390), instructor (1119) or the Health Service Division (1256) to inform of the accident place in order to get help as soon as possible. At the moment of life & death, only think of what can I do for him. At the crucial moment, everyone can save lifes.